October is going to be so exciting it will raise the dead! A shambling Guest Artist Edition is on it's way, just in time for the Halloween season! Braaaaains . . . BRAAAAAINS!!! 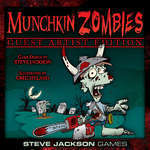 Our Guest Artist line continues with Munchkin Zombies Guest Artist Edition! It's the undead horde you love with a set of fresh organs . . . art! I meant art. Definitely not delicious brains. Ok, fine, brains too. Greg Hyland is known for being the original artist for Munchkin Fu (which recently got its own Guest Artist Edition), as well as the Lethargic Lad webcomic. He's also done work for LEGO, like storyboards for their movies. You can find an interview with the artist here on the Daily Illuminator. Preorder this and more at your Friendly Local Game Store!